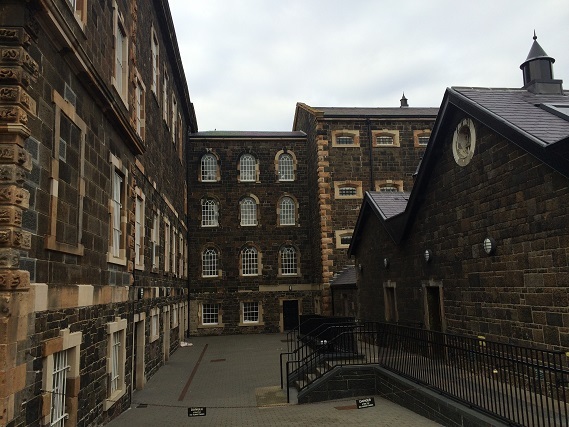 A flying visit to Northern Ireland to see family, we also managed to squeeze in a trip to something completely different – the Crumlin Road Gaol. 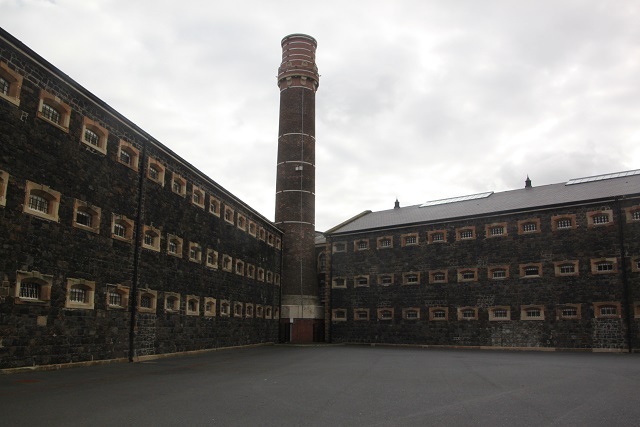 Opened in 1846, around 25,000 convicts have passed through this place from then until 1999 when it closed. Amongst these were some of the most notorious prisoners involved in paramilitary violence during the dark years of the Troubles. The whole place and the tour was engrossing and intriguing. I couldn’t recommend it enough. We pre-booked a couple of weeks in advance on-line so had no issue with tickets – it does get popular though so I’m not sure if turning up on the day would work. 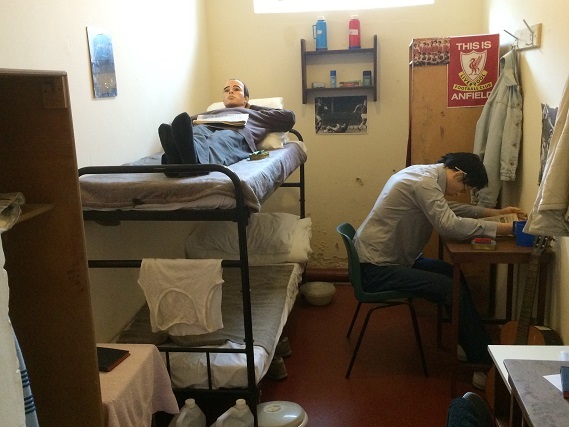 Our biggest challenge was finding the jail and the car park – not so easy. Driving into the grounds I felt a real sense of foreboding, you could really imagine how prisoners entering here must have felt. We checked in early and had some time before the tour to browse in the small museum. Lots of interesting artefacts, things to read and even the death mask of Albert Pierrepoint, the famed executioner. Some quirky photo opportunities here too. Our guide arrived, took us outside and told us about the history of the prison and the buildings. Having recently undergone a £10 million restoration the whole place looks as it would have done in Victorian times. 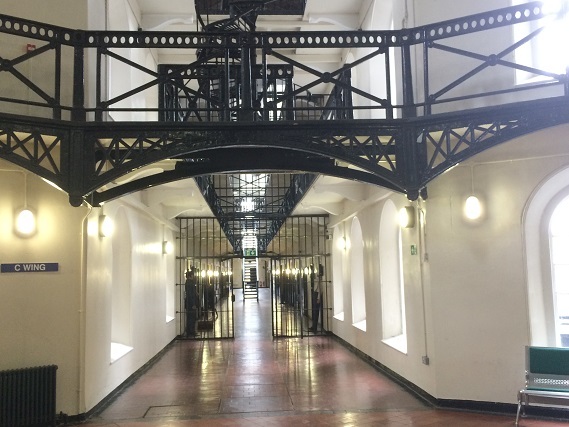 We saw the holding cells then went down into the tunnel, built in 1850 connecting the prison to the Crumlin Road Courthouse on the opposite side of the road. 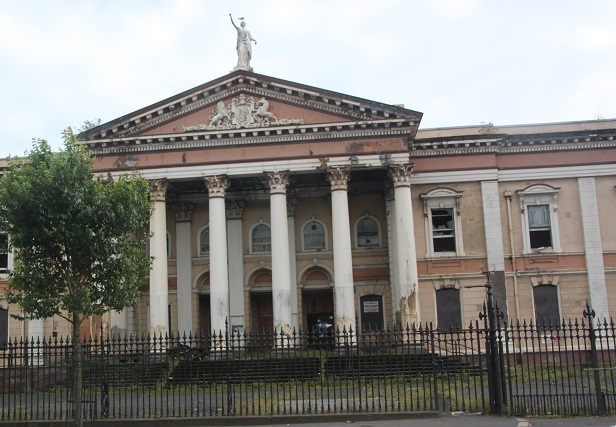 Unfortunately the courthouse is in a sorry state, it was sold to a private developer some years ago, nothing was ever done with it and it is now virtually derelict. As a result of this you can only go halfway through the tunnel. Interesting aside, apparently the phrase “take him down” originated here. 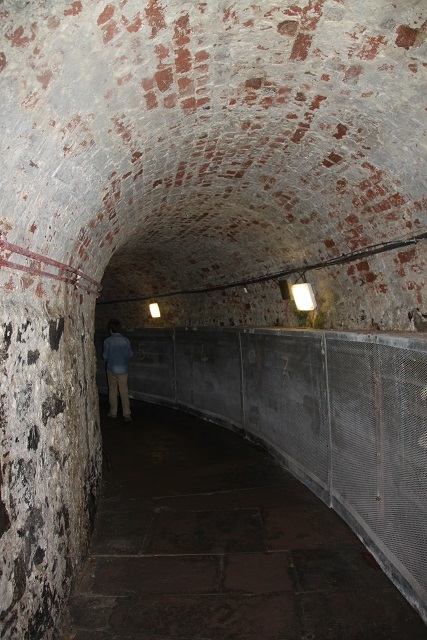 The judge would order the condemned prisoner in the courthouse to be “taken down” to the tunnel below and on to the jail. Entering via the governor’s office we emerged in the famous C Wing. Incredibly impressive flooring and wrought iron work but a creepy feel, enhanced by all those wax figures “watching” you. Maybe something even more spooky too – apparently this is one of the most haunted buildings in Ireland. 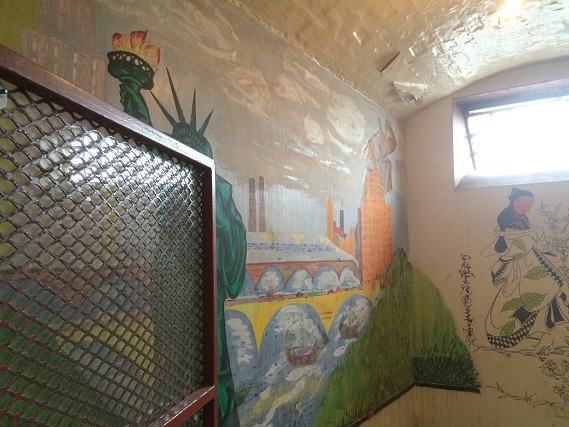 We saw various cells including the padded cell and another which housed some political prisoners who painted a mural on the wall. Last was the condemned man’s cell. 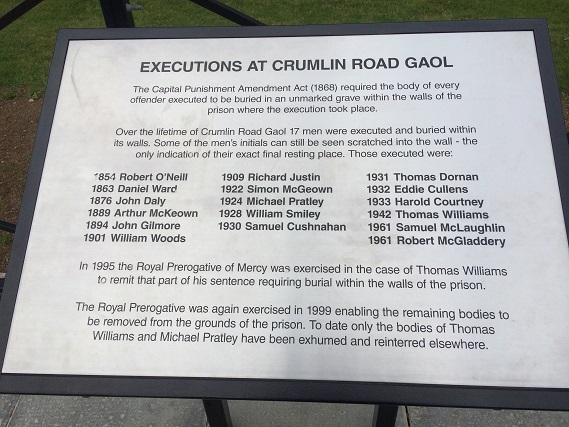 Seventeen men were executed here before the death penalty was abolished. 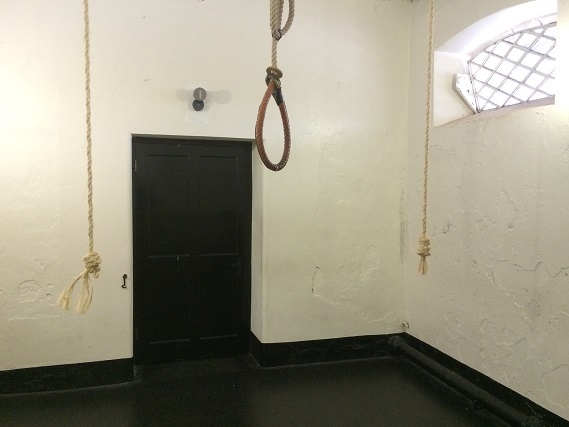 We entered the cell and the execution room – just thirteen steps away from the bed. The prisoner didn’t realise what was behind the door until it was opened and the whole process was completed very quickly. The noose swings still in the middle of the room. To say the atmosphere is chilling would be an understatement. Sobering and solemn, we passed through and Son was completely freaked out. Downstairs we saw where the body was prepared and laid out in the coffin. Outside we were taken to the area where these men were buried. The graves are unmarked and unconsecrated, however in places there are initials carved on the wall which shows some of the graves and who is buried there. No-one knows who did this. A walk through the exercise yard and the tour was done. Fascinating and gripping, this is definitely a Belfast must-see. A place full of history and incredible stories from long ago and the not so distant past, it definitely sent a chill down my spine. It’s fascinating, definitely worth a visit! Oh wow. I should definitely put this on my list! 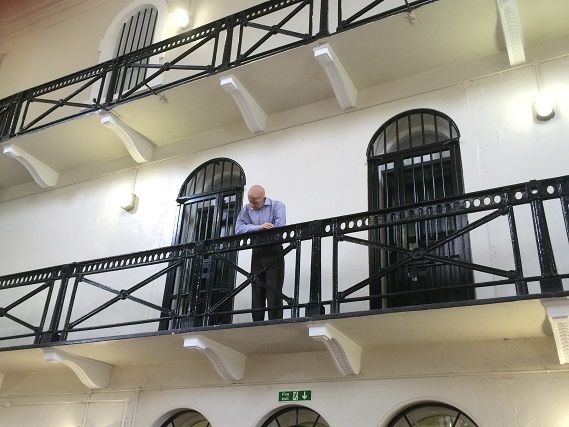 It’s fascinating on so many levels, from the Victorian history to the more recent dark days in Northern Ireland – one of the best tours of this type I’ve ever done. Son playing his convict role far too well! I know…. still the condemned man’s cell took the sting out of his tail!!! They’re interesting but this one especially so! Gosh this was spooky just reading about it Joy so can imagine what it must have felt like wandering round. 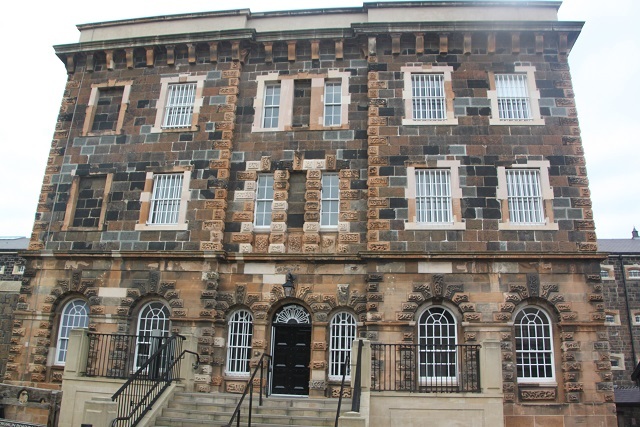 The condemned cell would have sent shivers up my spine too – can well understand why the gaol has a reputation for being haunted! 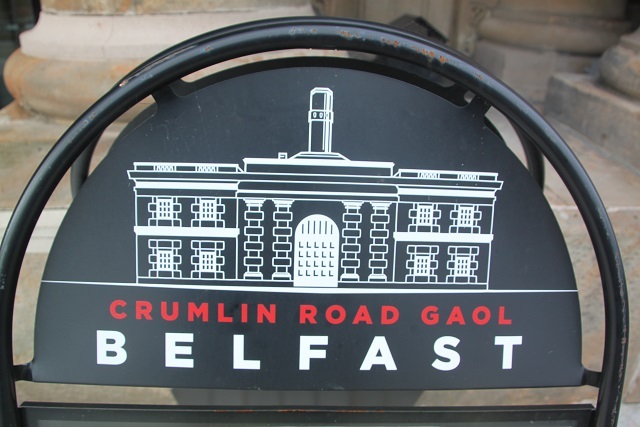 I remember the name “Crumlin Road Gaol” being in the news so much growing up for all the wrong reasons so am so interested to read about this tour and the history of the place – sounds well worth a visit some day! I know what you mean Rosemary about the “Crumlin Road” and the news – I too associated it with those bad old days. I did not realise though the great Victorian history behind this place as well as the more modern day tales. It is completely fascinating, we were all engrossed and more than a bit creeped out!! If you are ever in Belfast in your future travels I definitely recommend it. Another place I’d be interested to visit – my list is getting longer and longer! The museum sounds right up my street too! It has the most spooky atmosphere throughout and in the condemned man’s cell, well shivers really run down your spine, I felt chills there for sure. Very cool. 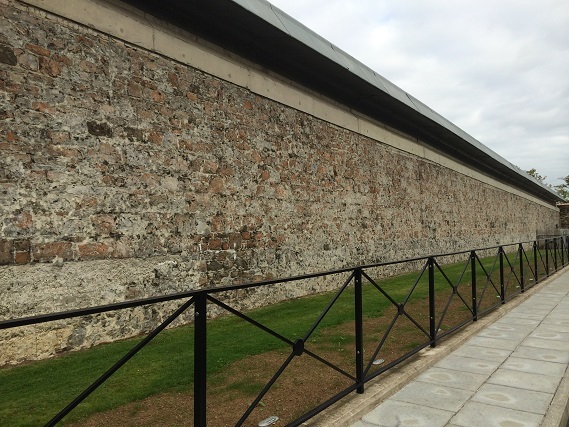 Did you make it to Kilmainum Jail in Dublin? Not yet – on the list for sure but never made it so far. It sounds great too though. 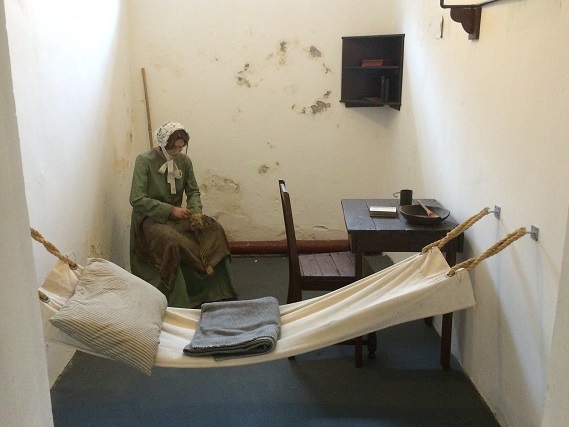 We did visit Wicklow Jail in the summer, that was seriously creepy too…. I didn’t even know they had one. Good call! What a fascinating place! I would love to take a trip there. Actually, having once spent the night at Inverary Jail, I would love to spend a night there. I bet that would be atmospheric. I’ve read a biography of Pierrepoint so seeing his mask would be pretty cool too. You’re braver than me Laura – a night in a jail, even the thought freaks me out! 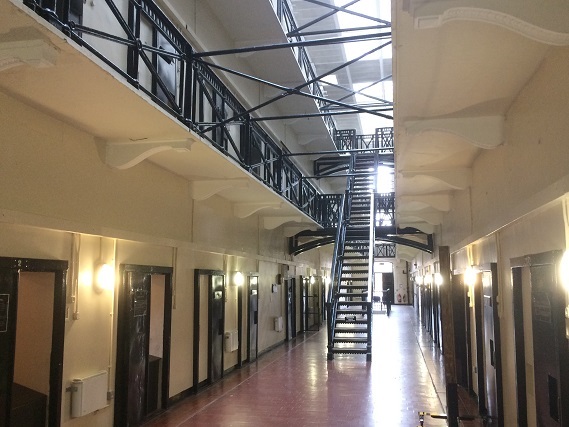 This place was so interesting though, I grew up with it in the news all the time and knew about all those notorious prisoners, what I never realised was all the Victorian history too. Pierrepoint fascinates me as well, that was another really interesting thing for sure. Yes, I had only ever heard of Crumlin Road Prison for that reason too. Until I read your post, I had no idea it had a longer, richer history. Now that looks pretty interesting. I love touring old prisons, Alcatraz being my favorite. But this looks very unique. We visited Alcatraz many years ago now George and I found it totally compelling – would love to go back there again sometime. There’s just something about old jails isn’t there, we’ve been to several as well, this one was fascinating. I have memories of its notoriety during the Troubles in Northern Ireland but discovered so much more interesting history there too. A fascinating afternoon even if it did freak our son out a bit!! 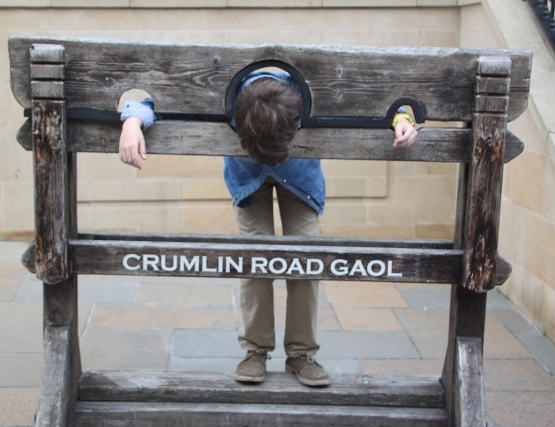 The photos of your son are a scream 🙂 I’m trying to imagine what heinous crimes he committed to land him in the stocks. It looks like a great tour – thanks for sharing! He played the part of a convict with aplomb!! It was a fascinating place to visit, so much to take in, I would even go back sometime. Chilling…I would be scared of going there! It is a very creepy place, I just can’t describe how strange the atmosphere is but so interesting and so much history, albeit a bit chilling. This is right up my alley! I would love to see this. In San Francisco I would often visit Alcatraz island. I love “true crime” books and history, so old prisons are a draw for me. Those wax figures though… creepy! This place has so much intriguing history – both really old and relatively modern, it was so great to see inside and hear all the stories. Super creepy though…. not least the wax people!! One of the most haunted buildings in Ireland? Winner! And the fact that inmates only moved out in 1999. 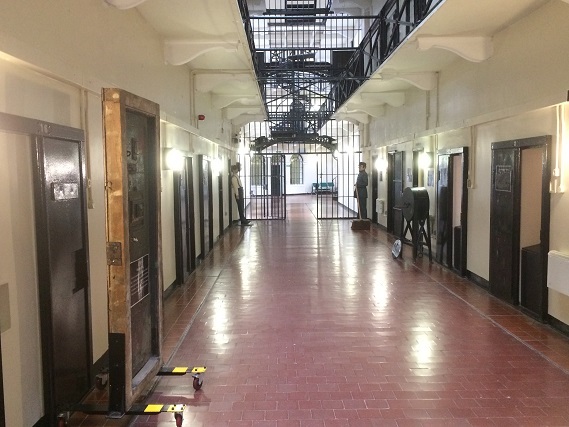 That’s pretty mind blowing I bet when you check out the cells… Especially the condemned cell… bit spooky. Would certainly send a chill down my spine too. But weirdly interesting all at the same time! Love the photos of your son! So incredibly spooky and spine chilling but so interesting. I loved the tour and all the history that goes with this place, our son loved larking about for all those pictures!! Oooh, interesting! This is definitely something to check out on my next trip home! It’s completely fascinating and very creepy – I would definitely recommend!